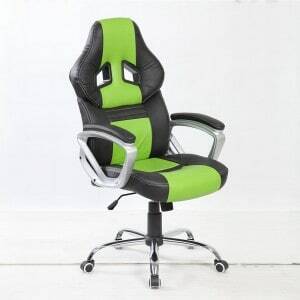 It’s not uncommon to use an office chair for gaming – as a matter of fact, many avid gamers do. 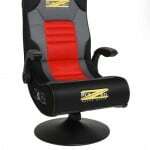 When BTM sent me the Executive Office Padded Leather Gaming Chair, I was brimming with excitement at the thought of replacing my old chair with this one. It had a very fashion-forward design, and it seemed sturdy – two of the qualities I really appreciate in a gaming chair. As an office chair, the BTM Executive Office Padded Leather Gaming Chair allows you to customize your experience. You can adjust the height of the seat to better accommodate your own height, and also control tilt tension to make your position more comfortable while you’re sitting. Keep reading to find out more about the BTM Executive Office Padded Leather Gaming Chair. I have always been appreciative towards office chairs, specifically because they’re usually designed for comfort – and the BTM Executive Office Padded Leather Gaming Chair makes no exception. I needed only ten minutes or so to have the chair fully put together – which, in my opinion, is beyond reasonable given that most other models I’ve tried required at least 20 or 25 minutes. Assembly instructions were clear and straightforward, telling which bolt is which and indicating the exact place where it should fit. Even without the instructions, I’m sure that I could have easily assembled the chair, but they generally made it simpler for me. Seat height was a little too low for me as I had to keep my legs either bended at a 50-degree angle, or slightly stretched out, otherwise my knees would be painful. 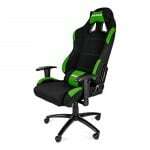 Once I adjusted the height of the seat, I could comfortably sit in the chair, with the controller in my hands, ready to immerse myself in my favourite video game. 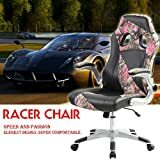 I really appreciated the waterfall design of the seat, which followed the natural shape of my legs (and specifically my knees), keeping me very comfortable while gaming. 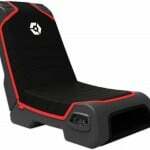 The back is also cushioned, offering proper lumbar support that helped prevent lower back pain – a definite plus if you like spending endless hours holding the controller! The armrests are padded, and I could actually keep my elbows sitting on them while I was playing. I was thankful to BTM for this, specifically because my arms didn’t fatigue as fast, and I could comfortably sit and play without having to pause the game and let my arms rest. Although it could have been larger, the seat should easily accommodate anyone, featuring an overall capacity of 250 pounds – very reasonable if you ask me. I asked one of my slightly overweight friends to sit and play, and the BTM Executive Office Padded Leather Gaming Chair fitted him nicely despite his larger physique. Given its price value of £79.99, I wasn’t expecting such great comfort from a chair that’s been initially designed for office use. 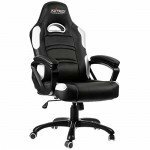 Still, there are a few aspects that make the BTM Executive Office Padded Leather Gaming Chair less than perfect for gaming. In the first place, this chair is very heavy, so you will probably have troubles moving it from a room to another. It took me quite some effort to place it in the desired location after assembling it, but I don’t really complain. Also, the wheels don’t roll as smoothly as expected. I suspect that this is due to the weight of the chair paired with the weight of anyone sitting in it, which prevents the wheels from gliding flexibly. I verified the theory by trying to move the chair when nobody sat in it, and indeed, rolling seemed less cumbersome. One last thing I must mention is the design. 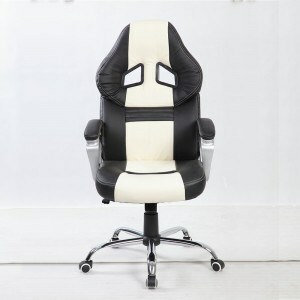 The BTM Executive Office Padded Leather Gaming Chair looks elegant for an office chair, but I don’t think that its design is dynamic and fun enough for a gamer. It’s bland and colours are dull, so you may want to consider another model if appearance matters to you. 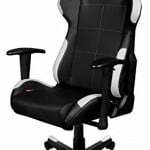 All in all, I can say that the BTM Executive Office Padded Leather Gaming Chair is definitely a good chair to try – and a pretty inexpensive option if your budget is tighter. Although BTM could have made it more visually-appealing, it still looks good in any room you’d place it, and it will certainly be very suitable for any gamer, regardless of age, height or weight.